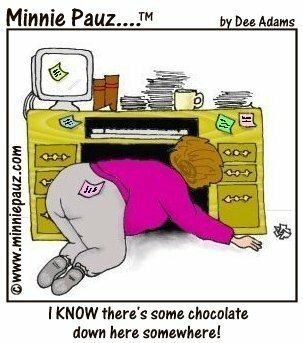 minniepauz.com - All Chocolate, All the Time! You are here: Home // Fun // All Chocolate, All the Time! 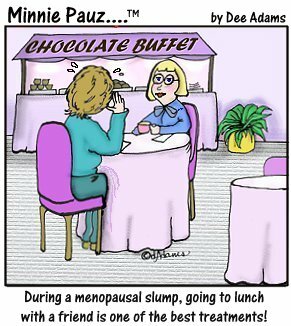 CHOCOLATE FOR THE MENOPAUSAL WOMAN! Choosing gifts for women can be a frustrating experience, unless you know the secret of "what women really want"! They want to feel good and chocolate makes them feel GREAT! Especially during menopause. And you don't have to worry about putting on a few more pounds, because there are many varieties that don't have sugar. What can chocolate do for a woman? Well, it can change her life, one Hershey's Kiss at a time! One of the most surprising super foods to hit the headlines is dark chocolate. It is loaded with health-promoting polyphenols -- anti-oxidants that may help lower blood pressure and promote vascular health. Cocoa has more polyphenols than red wine or green tea. But to qualify, the chocolate must contain at least 70 percent cocoa solids. Last month, Hershey introduced an extra dark chocolate that touts anti-oxidant power equal to three cups of tea, two glasses of red wine or 1 1/3 cups of blueberries. Impressive stats, but the company Web site (www.hersheys.com) points out that scientists are still investigating exactly how anti-oxidant scores relate to their activity in the body. Hot tip: Eat a chocolate bar before each meal. It'll take the edge off Your appetite and you'll eat less.